You may have heard of Guardians of Middle-Earth. It’s a MOBA like those chaps LoL and Dota, except its acronym doesn’t come with the level of coolness. It was released on the 360 and PS3 last December, but is now heading to the home of the MOBA. 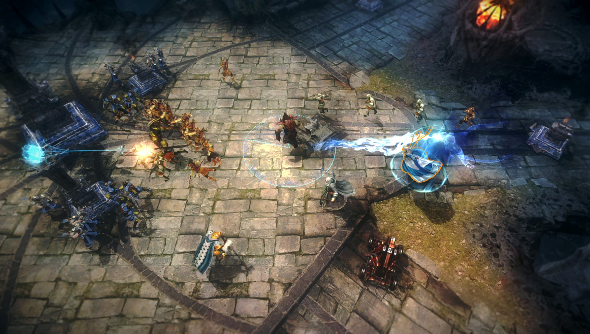 Guardians of Middle-Earth contains all the hallmarks of the MOBA, with lanes, turrets, and a collection of heroes. One of those heroes is naturally Gandalf, and if his ultimate attack isn’t slamming his staff down into the road, shouting “You shall not pass!” and blocking the lane from any creep advancement for thirty seconds, I’m not buying it. Actually that’s a point: you have to buy GoME. And at £14.99, it’s not a cheap MOBA, not when its main rivals are free. The pulling point here is most certainly the Lord of the Rings license, then. Is storming the right-hand-lane with Aragorn enough of a pull for you to spend? Guardians of Middle-Earth is released on Steam on August 29th.